Microsoft operating systems are not too shabby with backwards compatibility, but some things are well – too ancient. And really unaware of modern hardware (16MHz 80286 is more to their taste). 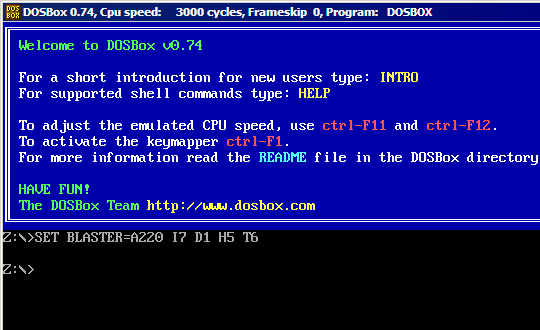 DOSBox is open source software that emulates DOS environment, primarily for running old games. App creates window that looks much like usual console, but is actually completely virtualized environment. This allows it to emulate wide range of legacy hardware and speed up or slow down as needed. DOSBox does not contain or require actual DOS files so it can be freely used without license. What goes on inside console can be natively screenshoted and recorded as video. It even supports networking to allow multiplayer over modern LANs. Setting are saved into user profile folder. There is portable version by PortableApps, but as of writing it wasn’t yet updated to recently released 0.74 version of DOSBox. App is closer to DOS in spirit than to modern software. :) There is some learning curve that starts with folders with applications to run must be mounted to DOSBox, using internal commands. Anyway you are running DOS games, command line should not be scary for you. Stuff is well documented and there is number of frontends available that simplify settings and editing configuration file. Great way to revisit some old games on modern computer. Had used this to play some games once..but since those games were before my time I don’t really know of any classic. I didn’t like the ones I played too much so I gave up. I find more satisfaction in Kongregate (which you had mentioned before)and other such sites. I am hardly a gamer myself in recent years. Still I had played with DOSBox in the past and it got recently updated so decided it is worth a post. :) Last time I brought it up it stirred my work with people rushing to revisit their favorite old games. Yes I too am not much of a gamer. I last played a biggie commercial game two or three years ago. Now with my school and college entrance exams finally over I have 2 or 3 months free ahead of me. I have to see what productive(html?) or unproductive use(games?) I put it to. Thanks! Though results start pouring in next week onwards. The good old DOS :), actually I use this really good DOS emulator for play that old games that don’t run anymore in the PC, this have several features for make old games more pleasant to the new generation (like Hi res Filter for low res games, etc), anyways that classic are good by them self. Other good alternatives for play old DOS graphical adventure games (like the funn Monkey Island series) is use other open source project called ScummVM. Thanks for suggestion, bookmarked to check out.